The Stokes Sentinel reported that Carly Bennett, 28 of Bentilee, Stokes, was fined and banned from owning pets for 10 years after a hearing in the North Staffordshire Justice Center. Bennett was twice visited by an inspector of the Royal Society for the Prevention of Cruelty to Animals (RSPCA) and each time, starving animals were found in the garbage-strewn backyard of her home on Trowbridge Crescent. On a visit in May, the inspector was told by neighbors, that a crate full of puppies had been left on a trash heap in the backyard. When the inspector returned later that day, Bennett said her husband had taken the puppies away. According to the Stokes Sentinel, prosecutor Roger Price told the court, “The inspector went into the back garden and was immediately hit by a very offensive smell. She saw three adult dogs, which were in good condition. “The garden was full of rubbish. There were car parts and other items regarded as hazardous to the animals,” he said. The inspector heard dogs whining behind a closed door. 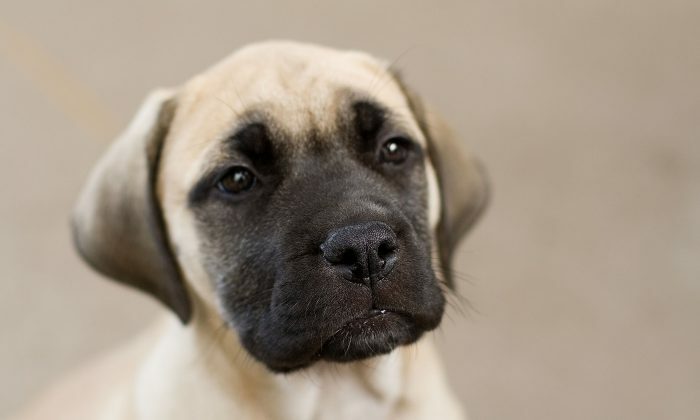 When she opened the door, four emaciated bull mastiff puppies streamed out and immediately began digging through the heaps of trash bags piled in the yard, apparently looking for food. “They ran into the garden and started rooting around in the rubbish bags. They appeared immediately to the inspector to be ravenous and desperate to find something to eat and drink,” Price testified. Bennett who was expecting her sixth child, told the inspector that the yapping of the puppies kept her up. According to the veterinarian, the puppies were between six and nine weeks old. Three months later, a police officer was called to the Bennett home on an unrelated matter, the Sentinel reported. That officer phoned in a tip to the RSPCA. The same inspector investigated, and found an adult bull mastiff, living in the backyard, which was as dirty and dangerous as it had been in May. The dog was also emaciated. Based on these two incidents, Bennett was charged with and convicted of, two charges of causing unnecessary suffering to an animal, and two counts of failing to ensure the welfare of an animal for which she was responsible. Her defense attorney, Tony Cooke, told the court that although the dogs stayed at her house, she was not the owner, and she had not wanted them when they were left there. “Mrs. Bennett never sought the responsibility for these dogs,” Cooke told the magistrates. Bennett received 12 months of community service and was ordered to take a 15-day rehabilitation class, and was also fined a total of $630. On top of that she was barred from keeping animals for 10 years. The Sentinel reports that all the animals have recovered from their ordeals and are now fully healthy.